Process: "registration / deregistration of balancing area"
The affected DSO must report to the BIKO at least 4 months + 10 working days before the planned change / start-up This applies for the following activities in the context of balancing area changes. This applies for the following activities in the context of balancing area changes. 3. All requirements with regard to the BIKO must be met by 3 months + 10 working days before the planned change / start-up at the latest; otherwise, the implementation date will be delayed by at least one month. The BIKO announces the EIC and the corresponding validity date to the DSO. 4. The BIKO publishes the current balancing area list on its homepage and as well on the homepage of the BDEW 3 months + 10 working days before the planned change / start-up. 5. and 6. The DSO informs its further market partners regarding the planned changes / start-ups minimum 3 months before. Please send the signed form to biko-edm(at)tennet.eu or the following fax-number: 0921-50740-2420. 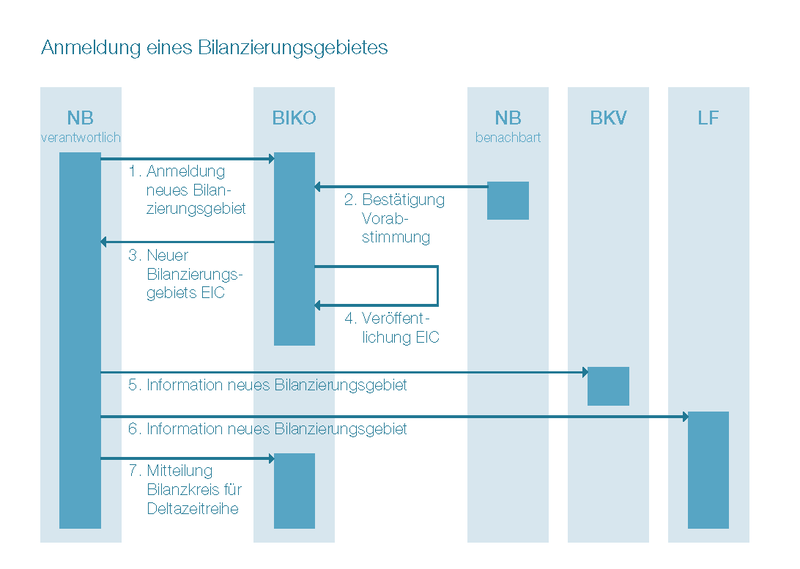 The existing communications parameters have to be interchanged in advance (at least 3 working days before) to guarantee an automatically communication. Note: If it is only a matter of a change in the assignment of metering points of existing balancing areas and of the already communicated master data (also the assignment of delta time series), and nothing else changes, the BIKO does not have to be involved in the process. In cases of uncertainty, please direct your questions to biko-edm(at)tennet.eu .